Your massage session is always tailored to your needs for that session. Therapeutic Massage – An anatomically oriented massage using various muscle therapy techniques in a focused manner. The intent is to bring about a positive change in the muscle tissues, increase muscle pliability, break up adhesions in the muscle fibers and increase blood circulation. Receiving regular therapeutic massage will help to decrease effects of an injury; decrease headaches, decrease effects of stress and tension and restore body and mind to optimal health. Whether you require an adjunctive therapy to physical therapy or chiropractic care or are doing self-care, therapeutic massage can help. Sports Massage – For daily or weekend athletes, sports and physical activity can cause common strains and injuries. Using specific muscle therapy techniques and stretches, sports massage can alleviate aches and pains and increase flexibility to enhance physical performance. Seated Chair Massage – The client remains clothed and sits on a specially designed massage chair. Seated massage focuses on high stress areas of the head, neck, shoulders, back and arms with the therapist using very little, if any, lotion. Thumb, fingertip and elbow pressure is used on specific stress points. Session length various anywhere from 5 minutes to ½ hour. Seated massage is an efficient way to receive fast relief from stress and tension. 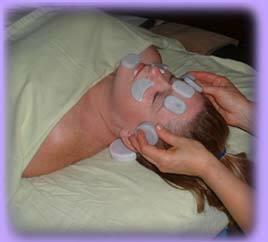 Cold Stone Therapy for Headaches - Are you one of the 50 million people a year who suffer from headaches? Would you like to try a more natural -- yet powerful -- way to get relief? Cold stone therapy consists of specific massage strokes by themselves and also utilizing cold marble stones to combat the pain of headaches and migraines. The specific massage strokes help to flush out the toxins that the pain and tightness of the headache creates while the cold stones help to decrease the inflammation that occurs in the neck, skull and face. Experience the natural way to rid yourself of a headache or migraine. Heated Oil Hand Massage - Dry hands, tired or arthritic joints? A heated oil hand massage eases pain as well as makes your skin wonderfully soft and smooth. A focused massage on the wrist and finger joints combined with warm oil and warm stones will release pressure off joints. Finishing the treatment with a paraffin dip will let the heat and therapy soak into the joints for added relief. Foot Scrub - Are your feet itchy from dry skin, rough from summer bare feet, just plain tired? Enjoy rejuvenating your feet with a Foot Scrub! Using natural jojoba oil and sea salt, dry skin is scrubbed away while your calf and foot muscles are massaged. Warm stones are applied on the shins, calves and feet to aid in alleviating soreness as your tired muscles are eased.